This earnings season has been a story of semi-surprises thus far with 275 members of the S&P 500 having reported as of Friday, October 27th. According to Factset, 76% (209 of 275) of companies that have reported Q3'17 results have beat their EPS estimates. This is above the trailing 4-quarter average EPS beat percentage of 71% and well above the 5-year average of 59%. In addition, these companies have beat their expected earnings on average of 4.7% which is also above the 5-year average of 4.2%. The reason this earnings season has been semi-surprising is due to the minuscule impact these positive surprises have had on share prices. Companies that have reported upside earnings surprises have seen an average price impact of only +0.1% immediately following the announcement. Investors typically expect a stock to jump much higher when the company beats their estimates. We're not seeing this impact because the market has already priced in these positive earnings as illustrated by the S&P 500's premium valuation. The forward P/E ratio for the S&P 500 currently stands at 17.9x. This is well above its 5-year average of 15.6x and its 10-year average of 14.1x. The semiconductor industry is highly cyclical and is constantly facing booms and busts as demand for its products quickly changes. However, it is worth taking a closer look at stocks in this industry when times are good as they currently are; iShares PHLX Semiconductor ETF (SOXX:NASDAQ) is up 40% since the beginning of the year and nearly 10% in the last month. Therefore I was curious to see if there were still any companies that have (1) exposure to the semiconductor industry, (2) have yet to report earnings, and (3) are still trading at a fairly reasonable valuation implying that there's still upside potential. The company's Forward P/E multiple of 13.6x is not only well below that of the S&P 500's 17.9x but below all of its comparable public companies: Teradyne's (NYSE: TER) 21.2x, Cypress Semiconductor's (NasdaqGS: CY) 18.5x, Analog Devices' (NasdaqGS: ADI) 20.6x, and Cadence Design Systems' (NasdaqGS: CDNS) 31.1x. The company is expected to report earnings on Thursday, November 9th after the market closes. Although the stock is up 105% over the last three years, shares down -3% year-to-date as Microsemi has reported earnings in-line with expectations over the last three quarters. Don't be surprised if that trend changes next week. 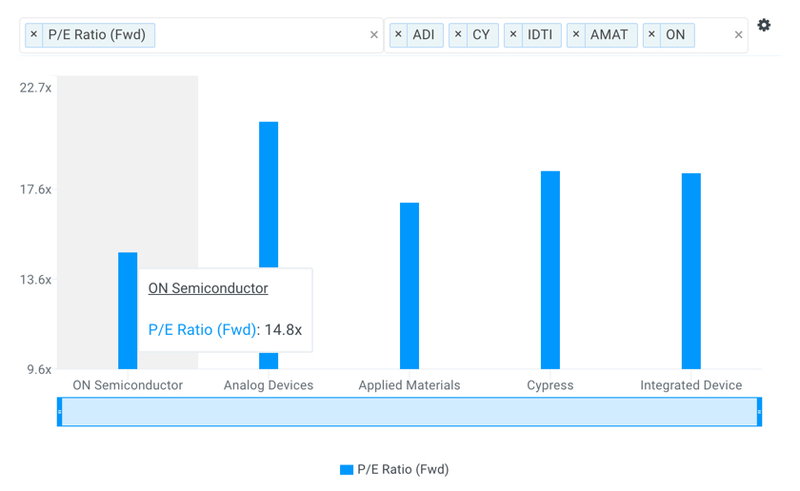 ON Semiconductor's forward P/E multiple of 14.8x is below selected peers: Analog Devices' (NasdaqGS: ADI) 20.6x, Applied Materials' (NasdaqGS: AMAT) 17.0x, Cypress Semiconductor's (NasdaqGS: CY) 18.5x, and Integrated Device Technology's (NasdaqGS: IDTI) 18.4x. The company's shares last traded at $21.32 as of Tuesday, October 31st, approximately 99.8% of its 52-week high. The stock is up 64% year-to-date and 13% over the last month. Analysts are expecting management to announce $172 million of Net Income on Monday, November 6th. 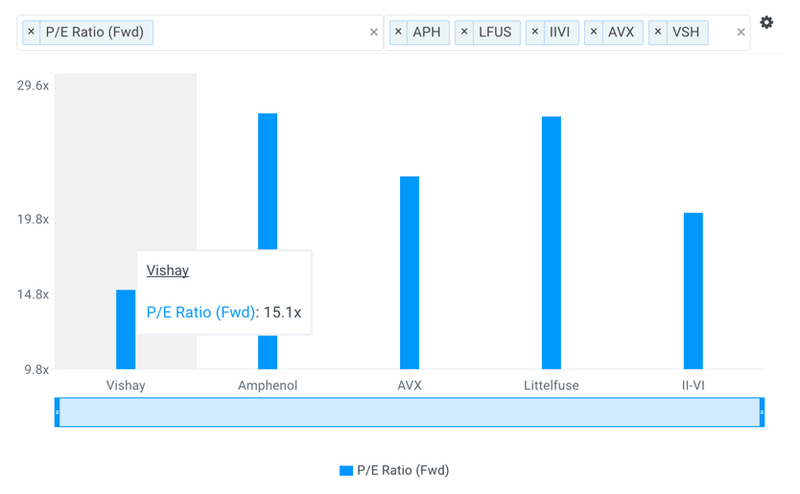 Vishay's forward P/E multiple of 15.1x is below the S&P 500's 17.9x and also all of its comparable public companies including Amphenol's (NYSE: APH) 26.9x, AVX Corp's (NYSE: AVX) 22.7x, Littelfuse's (NasdaqGS: LFUS) 26.7x, and II-VI's (NasdaqGS: IIVI) 20.2x. 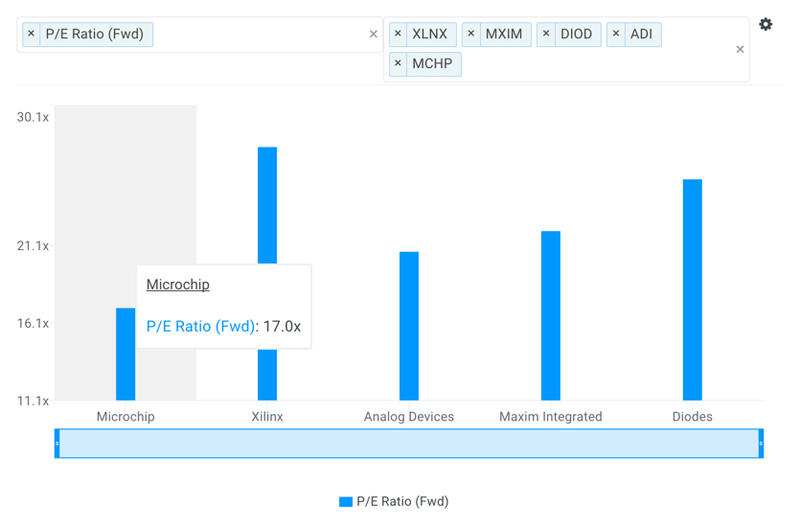 Microchip Technology's forward P/E multiple of 17.0x is below comparable public companies Xilinx's (NasdaqGS: XLNX) 27.4x, Analog Devices' (NasdaqGS: ADI) 20.6x, Maxim Integrated Products' (NasdaqGS: MXIM) 22.0x, and Diodes' (NasdaqGS: DIOD) 25.3x. 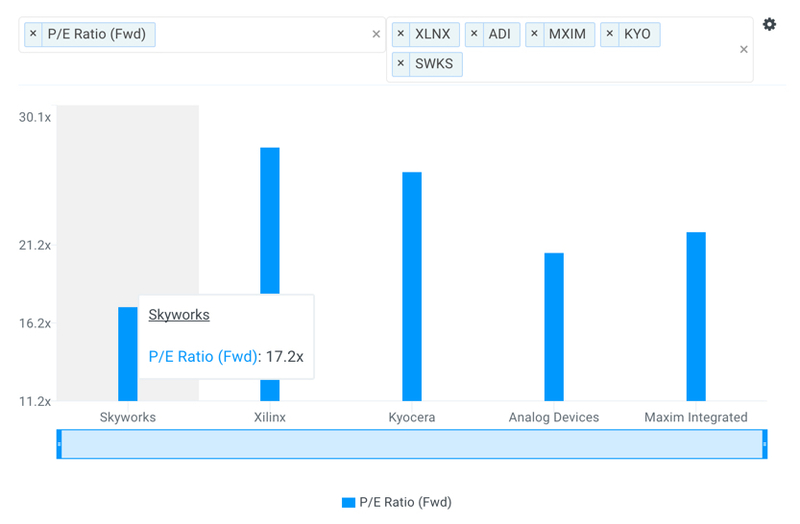 The company's forward P/E multiple of 17.2x is below all of its peers: Maxim Integrated Products' (NasdaqGS: MXIM) 22.0x, Analog Devices' (NasdaqGS: ADI) 20.6x, Kyocera's (NYSE: KYO) 25.8x, and Xilinx's (NasdaqGS: XLNX) 27.4x. Skyworks is expected to report earnings on Monday, November 6th after markets close and analysts are expecting the company's bottom line to grow by 17.4% (CapitalIQ). 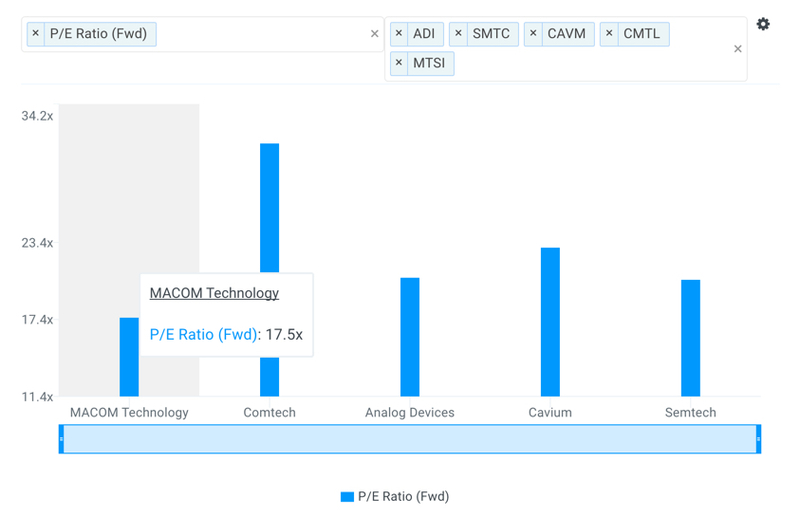 The company's forward P/E multiple of 17.5x is below all of its selected comparable public companies: Semtech's (NasdaqGS: SMTC) 20.5x, Cavium's (NasdaqGS: CAVM) 23.0x, Analog Devices' (NasdaqGS: ADI) 20.6x, and Comtech Telecommunications' (NasdaqGS: CMTL) 31.1x. Unlike the other semiconductor names on this list, MACOM's stock is actually down -13% year-to-date and -10% over the last month. The majority of these losses are a result of the company's disappointing Q2'17 earnings announcement. Shares fell 25% after management reported net profit that grew 57% but missed analyst estimates by 3.6% according to CapitalIQ. However, expectations are much lower for Q3'17 with Wall Street projecting earnings growth at only 2.1%. Management is expected to be announced on Tuesday, November 14th. 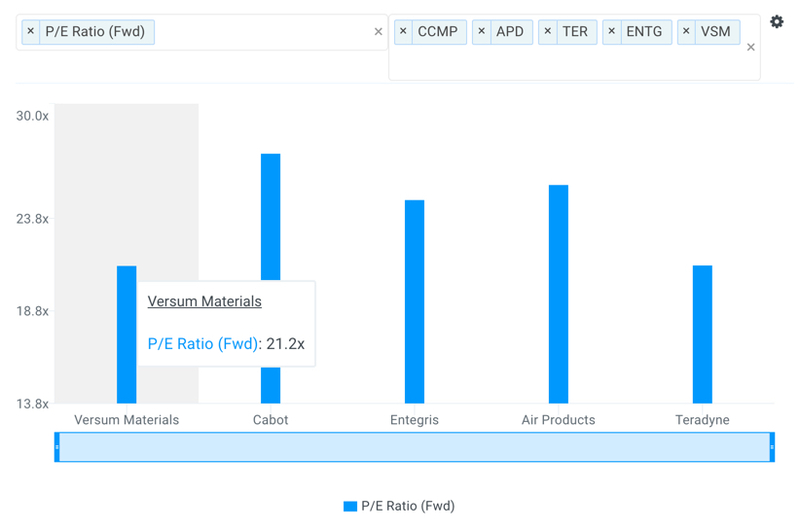 Versum's forward P/E multiple of 21.2x is slightly below the IT sector average of 21.4x and below peers Teradyne (NYSE: TER), Air Products (NYSE: APD), Entegris (NasdaqGS: ENTG) and Cabot Microelectronics (NasdaqGS: CCMP). The company is expected to report its Q3'17 earnings on Thursday, November 9th. Versum has beat its earnings estimate every quarter since its spin-off (four quarters of data). Analysts are expecting management to announce $51 million of Net Income implying growth of 8.1% according to CapitalIQ.